John Wayne returned to the role that won him an Oscar in this sequel to the western classic True Grit. Rooster Cogburn (Wayne) has once again been stripped of his badge after some questionable behavior with his gun, but he’s given the chance to earn it back after an especially appalling crime demands an experienced lawman. A gang of violent and ruthless criminals, led by Hawk (Richard Jordan) and Breed (Anthony Zerbe), have stolen a shipment of explosive nitroglycerine and cut a swath through a village led by a preacher and his flock. The preacher died, along with many others, and his daughter, Eula Goodnight (Katharine Hepburn), is determined that the outlaws will be brought to justice. Cogburn is given the task of tracking down the criminals, but he’s less than enthusiastic about the fact Goodnight insists on tagging along. 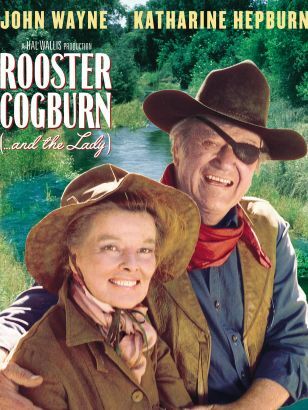 Rooster Cogburn marked the first (and last) time John Wayne and Katharine Hepburn would work together on screen; it was also the final film from noted producer Hal Wallis. Mr. Rat, I have a writ here that says you are to stop eating Cheng Lee’s cornmeal forthwith. Now, It’s a rat writ, writ for a rat, and this is lawful service of same! [to Mattie] See? He doesn’t pay any attention to me. [BANG! he shoots the rat] You can’t serve papers on a rat, baby sister. You either kill him or let him be. Baby sister, I was born game, and I mean to go out that way. General Price don’t belong to me. He just rooms with me. Cats don’t belong to nobody. ‘Course, Idepend on him. A fella that carries a big-bore Sharps carbine might come in handy… if we get jumped by elephants, or buffalo, or something. LaBoeuf, if you get crosswise of me you’ll think a ton of brick had fell on you! You’ll wisht you was back at the Alamo with Travis! Young fella, if you’re looking for trouble, I’ll accommodate you. Otherwise, leave it alone. Ned doesn’t go around killing people for no reason. Had he a reason, he’d kill them.